REAPsystems chief technology officer, Dr Dennis Doerffel, with the engine. Engineers from the University of Southampton are helping to develop an electric-hybrid engine for Venice water taxis this summer to provide cleaner, greener transport. Venice, a UNESCO World Heritage city, has approximately 20,000 leisure craft and 550 taxi boats serving some 32m visitors every year. All are currently diesel-powered meaning Venice suffers from high levels of air and noise pollution which affects the water, architecture and health of both residents and tourists alike. 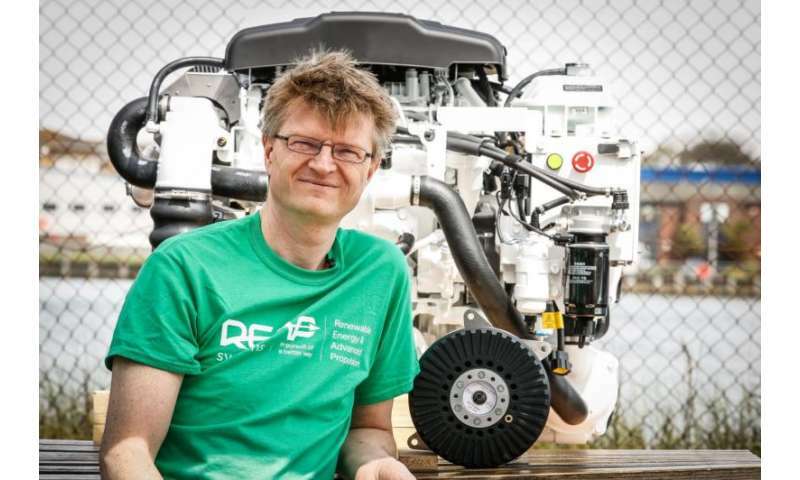 Working with REAPsystems, a UK-based independent specialist in advanced propulsion systems, the Southampton engineers are creating a clean drop-in hybrid diesel electric engine that can be installed by any boat builder and fitted into all existing boats. The system uses the latest diesel engine technology paired with a high-power, compact and efficient electric motor and inverter as well as a modern lithium-ion battery and advanced system control unit. In the city, the engine can be 'clutched out' to allow pure electric drive - no noise, no pollution, no vibrations, no fuel consumption. During medium to high speed, the diesel engine automatically takes over. During diesel operation, the electric motor works as a generator, recharging the batteries and pushing the engine into a more efficient operation. The electric motor may also assist in order to reduce exhaust emissions. Professor Suleiman Sharkh, Head of Mechatronics at the University of Southampton, said: "The benefits are clear: no noise, no pollution, no vibrations when operating in the city. Our demonstration with the water taxi will inform the local authorities, so they can tighten their regulations. Thus, the reduced maintenance cost and the halved fuel consumption will convince operators to switch to these green engines." The hybrid-drive taxi boat will be tested this summer to coincide with new legislation concerning pollution from waterborne traffic. REAPsystems chief technology officer, Dr Dennis Doerffel, said: "Our crowdfunding campaign is a complete reversal of the usual commercial approach. We involve the public on our journey. This way we can kickstart the hybrid revolution together."